Ever wonder what really goes on behind the scenes in the food and beverages industry? Trade shows are the best place to learn all about individual companies, their power products and newest launches! 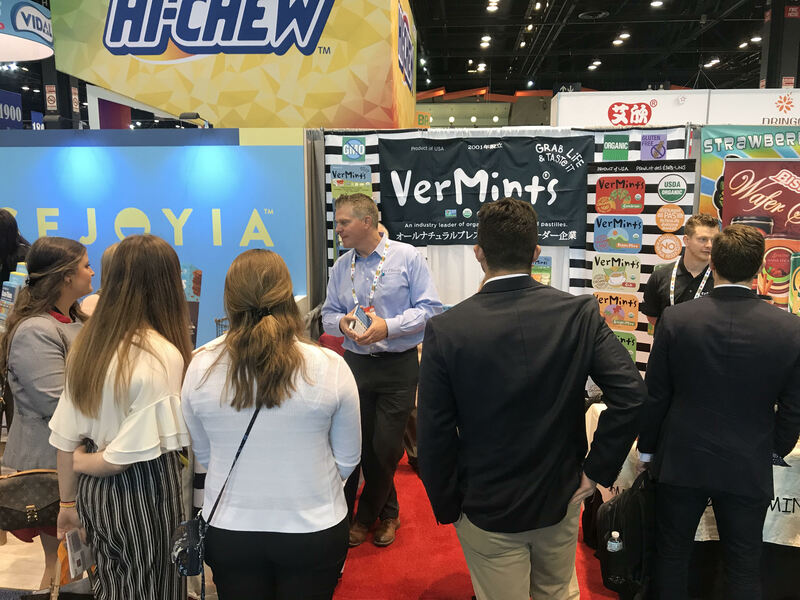 Our VerMints team attends ten to fifteen shows a year all over the world, and last week we participated in some of the most populated in the country. 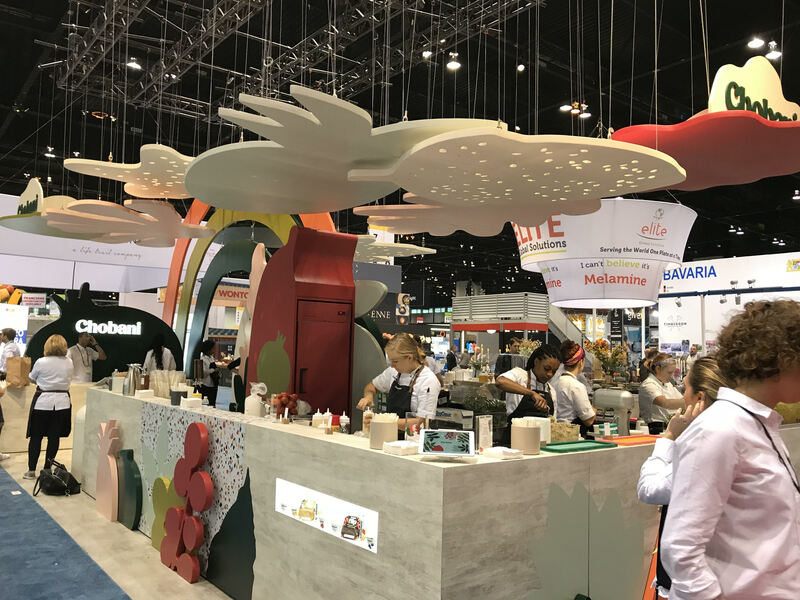 The McCormick Place in Chicago, Illinois is the largest convention center in North America, and last week it was the host for the National Restaurant Association show as well as the Sweets and Snacks show, both of which our team was in attendance of. You may be wondering what types of exhibitors attend these shows, and what do they do while they're there? Smaller companies like, yours truly, only need a reduced amount of space to really connect with our consumers and draw them into conversation about our products. On the other hand, you may have a larger company such as Chobani who wants their booth to be flashy, and really attract a crowd from any part of the room. It was interesting to see all the different marketing techniques companies used, and we found a common technique was the taller the better. If you could see hanging decorations from the ceiling of a booth that was located in the back of a hall, you could definitely bet that attendees were venturing over there. 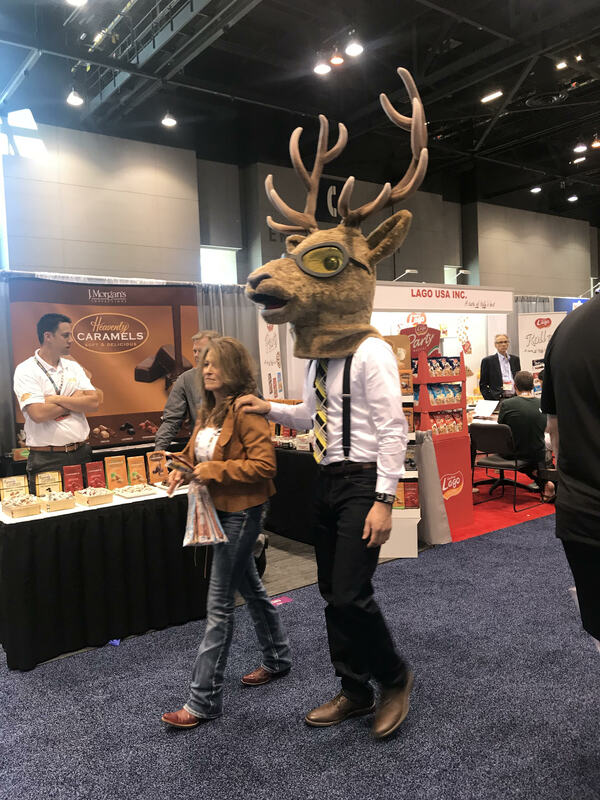 As for other marketing methods, it was common at the sweets and snacks show for vendors to dress up. We saw ladies decked out in bright pink riding around the show on segways, a buff man walking around in a baseball uniform representing big league chew, and even people dressed up in mascot suits! Entertainment is definitely a huge part of this show. Now you think you have a better idea of what a show may look like? Well keep guessing! We forget about all the equipment that really allows businesses to run smoothly such as large ovens for pizzas, portable bars, the most efficient cleaning equipment, comfortable shoes for the workplace, and over-sized blenders big enough to bathe in! Truly, we forget some of these things exist. Yes, shows are mainly about business, but also about making a visit to the show and your booth a true experience. The show coordinators assist with this by bringing in different types of entertainment. Ever watched bar rescue? A few days in, the show had guest visitor Jon Taffer signing his new book “Don’t Bullsh*t Yourself” for exhibitors and attendees. Ever listened to country music? The show coordinators even invited country star Keith Urban to perform for those who purchased tickets. For the Sweets & Snacks show, the confection staff hosts a very cool opportunity for students looking to possibly enter this industry. One of our own employees participated in their three-day internship which included learning from different companies about the processes they endure to create products as well as their company messages and marketing strategies. After being educated about the companies and the layout of the show, they pair up with a host and guide tours around the halls to specific booths that can really reach all the different parts of the industry. Check out VerMints President as he delivers his speech to the eager interns in the picture to the right. In the food and beverage industry there is always more to learn. Whether it be new products coming out, new knowledge of ingredients that are healthy or unhealthy for you, or even companies buying others, the information is ever forthcoming. Even as a regular consumer of food and beverages, we would definitely recommend the thought of attendance to one of these conventions…even if it’s just for the free samples! After all, you may never know what your next favorite treat may be if you aren't willing to try new things. Grab life and taste it!